Wright State had one of the largest representations of any university at an annual aerospace forum in Florida that drew 4,000 scientists and researchers from around the world. Wright State University, named after the Wright brothers, was well represented at an annual aerospace forum in Florida that drew 4,000 scientists and researchers from around the world. Wright State had one of the largest representations of any university at the American Institute of Aerospace and Astronautics SciTech in Kissimmee, Florida, on Jan. 8–12, eclipsed by only a few delegations such as those from the University of Michigan and University of Maryland. Much of the aerospace research done at Wright State is support of the Air Force Research Laboratory and Wright-Patterson Air Force Base. 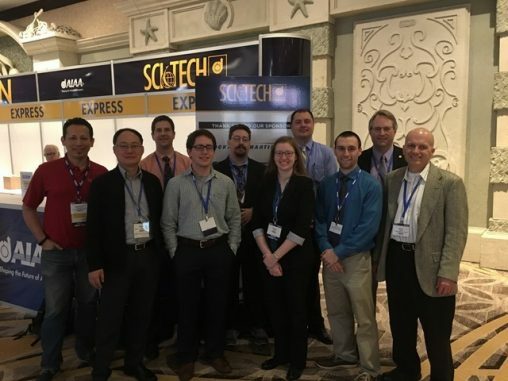 Wright State students and faculty presented six papers at the Florida technology forum. Wright State alumni presented 10. AIAA is a professional society for the field of aerospace engineering, representing more than 30,000 members from 88 countries. The technology forum consisted of 11 technical conferences and represented more than a 60-year history of delivering technological findings and innovation in aerospace. Joseph C. Slater, chair of Department of Mechanical and Materials Engineering at Wright State’s College of Engineering and Computer Science, served as deputy technical chair of the forum, one of the top leadership roles. As deputy technical chair, Slater assisted in managing the sessions in seven of the technical conferences. Next year, he will move up to technical chair. The Wright State delegation included Slater, Harok Bae, Daniel Clark, Emma Veley, Jacob Dickel, Mitch Wolff, Bayindir Saracoglu, Christopher Marks, Andrew DeSomma and Chase Nessler. Fall commencement at Wright State capped a year that saw a record number of students graduate from the Department of Mechanical and Materials Engineering. The 237 graduates, including 20 from the Lake Campus, were the most in the 30-year history of the Mechanical and Materials Engineering programs and included the first aerospace engineering graduate.